If only we could relocate all democrats to one of these places where the temperature is getting down to -50 degrees, and as an added bonus no fossil fuels will be allowed for heating–only green, renewable energy. Well looking at the maps, Illinois, Michigan, Minnesota, NY, Maine and all the other north east states are already havens for liberals.. Ergo they are already living in those temps.. Just without your restriction on fossil fuels.. 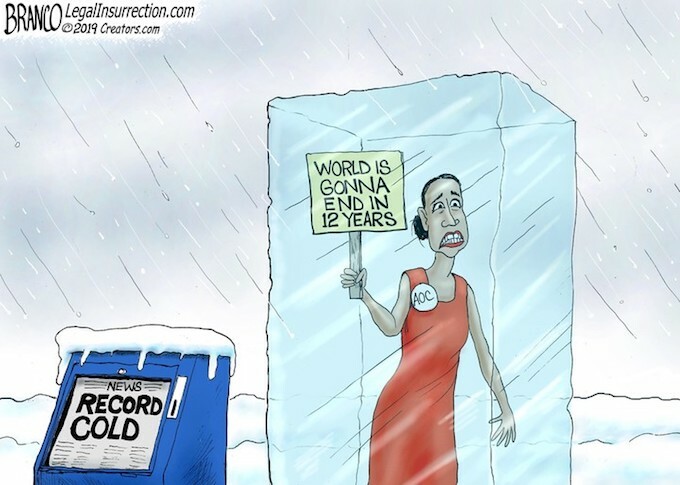 Global warming, of course, melted her brain. Oh, good question, “What brain?”. If she gets the changes she wants the 12 years may be close to being correct, but it won’t be due to just the weather. Just hope y’all recognize the whole “global warming/climate change” bovine feces is all about eliminating God. In the Declaration of Independence, paragraph 2, 1st sentence includes, “…all Men are created equal, that they are endowed by their Creator with certain unalienable Rights…” If you believe this statement, no man can grant you OR TAKE AWAY any God-given Rights (as in Rights enumerated in the Bill of Rights.) This concept completely eliminates all DemocRAT (socialist, Marxist, communist) agendas UNLESS we foolishly relinquish those rights by electing DemocRATs. Every vote for a DemocRAT is a vote AGAINST your God-given Rights – and by extension, a vote to abolish God. That phrase never seems to make sense to me..